Mosquito Control Peoria & Goodfield IL | Tri-County Irrigation & Plumbing Inc | TCI Companies, Inc.
Take in the pleasures of your own yard in complete comfort. Don’t be at the mercy of annoying insects, mosquitoes, and their painful bites. With MistAway Systems, mosquitoes and other biting insects will be effectively eliminated from your yard. 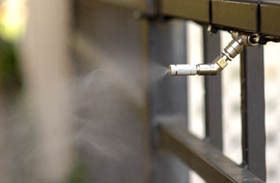 MistAway works by spraying a fine mist of botanical insecticide through a series of misting nozzles installed on your property. With expert installation, these nozzles virtually disappear in the landscape. The misting unit electronic controller works automatically or with a handheld remote. 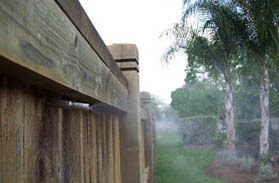 Typically twice a day a 30-60 second mosquito killing mist is dispersed to control the pests when they are most active. The MistAway digital dosing system allows the user to program the correct dose of insecticide for their application. 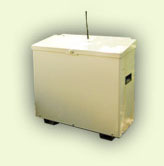 The insecticide is stored in this easy to locate unit and mixes a fresh batch at each activation. 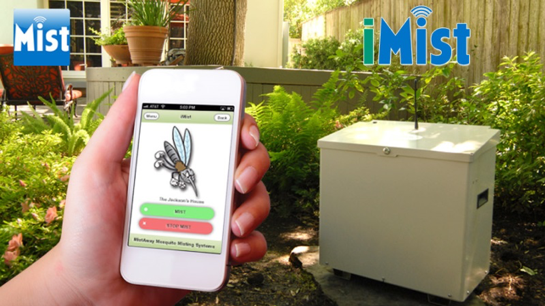 Activate your MistAway system automatically or remotely using the iMist monitoring app for ultimate mosquito control. The app allows you to activate the misting wirelessly to trigger a remote mist for complete control.